NutroVape Natural Vaporizers Reviews - Is It a Scam or Legit? Available in 11 different formulas, NutroVape Natural Vaporizers promise to help you relax, sleep, recover from a night out, boost energy and immunity, and even improve your performance between the sheets. NutroVape manufactures 11 different natural vaporizers that promise to fit in your pocket and deliver nutritional supplements quickly and effectively into your lungs, allowing you choose how you want to feel, whenever and wherever. The website advertises that each vaporizer contains USA-made oils, USP grade ingredients, and is free of alcohol, gluten, and sugar, as well as nicotine or medications of any kind. Josh Matzkin founded NV Nutrition (dba NutroVape) with the goal of getting away from energy drinks and obtaining clean, mild energy that wasn’t harsh on his body. But does that necessarily mean that one of the company’s natural vaporizers will deliver meaningful value for the money? Let’s start by taking a look at their lineup and ingredients. Which Products and Ingredients Are Found NutroVape’s Lineup? Based on what’s advertised on their website, the core premise behind NutroVape’s Natural Vaporizers is that the supplements they contain are delivered into the lungs through a process called micro-aerosolization. In layman’s terms, they’re delivered to the brain and bloodstream faster and more efficiently than taking a pill or capsule. To do this, the safe, 130 mAh Lithium polymer battery in each vaporizer heats the liquid it contains to a specific temperature, which is then inhaled. NutroVape indicates that effects are almost immediate since they don’t have to be absorbed through the digestive tract. Each ingredient found in NutroVape's formulas is American-made, produced in an FDA-registered laboratory, and is manufactured without the use of diacetyl. The company also lists certificates of analysis on their website for each formula, along with a Material Safety Data Sheet (MSDS) and toxicity testing report. NutroVape’s Natural Vaporizers will typically last one to three weeks with regular use. If enjoyed sporadically, they claim each one could last 40-60 days. The vaporizer will alert you when it’s depleted of oil by flashing a green light at the tip (or, if you’re not inhaling any vapor). You can use the Sleep vaporizer as many times as your body needs, although the company emphasizes that you shouldn’t exceed five inhalations in an hour. Ingredients include: All Natural Vegetable Glycerin, Propylene Glycol, All Natural Melatonin, All Natural Chamomile Extract, All Natural Passion Flower Extract, All Natural L-Theanine, Natural and Artificial Flavorings. All Natural Hoodia Gordonii, All Natural Garcinia Cambogia, All Natural Green Tea Extract, and All Natural L-Theanine, All Natural L-Carnitine, and a proprietary blend of natural flavorings. NutroVape instructs that you should take five inhalations with a glass of water 15 minutes before a meal. For best results, you’ll want to combine with a healthy lifestyle consisting of regular physical activity and a proper diet. All Natural Vegetable Glycerin, Propylene Glycol, All Natural Prickly Pear Extract, All Natural Milk Thistle Extract, All Natural Green Tea Extract, All Natural L-Theanine, All Natural Glutathione, All Natural Turmeric Root Extract, All Natural Vitamins B-12, B-6, B-1, Natural and Artificial Flavorings. For best results, the company recommends inhaling 10 times before your first alcoholic beverage, and then continuing use while consuming alcohol (no more than 10 inhalations per hour). They add that you should combine with two, 2.8 oz. glasses of water after your last alcoholic drink. Together, we’re told you can expect to feel refreshed and alert with clean energy and no crash. Simply inhale for three seconds as needed. Don’t exceed 20 inhalations in an hour. All Natural Vegetable Glycerin, Propylene Glycol, All Natural Guarana Extract, All Natural Theobromine, All Natural L-Tyrosine, All Natural L-Theanine, All Natural Vitamin B-12, All Natural and Artificial Flavorings. It’s intended to help you stay motivated and maintain concentration, although NutroVape emphasizes you shouldn’t exceed more than 20 inhalations in an hour. Chamomile Extract, Lemon Balm Extract, Passion Flower Extract, Valerian Root Extract, Natural and Artificial Flavorings. A formula NutroVape created to help boost your immune system, fight against coughs, colds, and viruses, and keep you healthy on a regular basis. A mix of vitamins B12, B6, B2, and B1 that NutroVape claims will help support the production of cellular energy, and allow your brain and neurological senses to focus. Horny Goat Weed Extract, Passion Flower Extract, Longjack Extract (Tongkat Ali), Guarana Extract, Ginseng Extract, Maca Extract, L-Theanine, Natural and Artificial Flavorings. These two new vaporizers contain only flavored vegetable glycerin, with no additional supplements or ingredients. How Much Do NutroVape Natural Vaporizers Cost & Where Can You Buy? Regardless of the formula, each NutroVape Natural vaporizer is priced at $9.99 (or, $8.99 if you agree to automatic subscription shipments every 15, 30, or 60 days) when purchased individually. If you opt for a subscription, it can be canceled at any time, with no commitments. When bundled in packs of 5+, 7+, or 9+, customers can save between $6.96 and $14.92 per order. Customer support can be reached at 800-310-9058 or help@nutrovape.com. We also found their online chat representatives friendly and quick to respond to any of our questions. Are There Other Natural Vaporizers Like NutroVape? As we can see, NutroVape is the lowest priced option above, followed by VitaCig and VitaminVape. Keep in mind, though, that while you might pay a higher initial price ($27.95) for VitaCig’s Excalibur vaporizer, each replacement capsule comes in at about $3.60. This means that if you enjoy their flavors, you could quickly make up the difference with regular use. Along these same lines, we encountered standalone third-party vaporizers with refillable chambers for as little as $20 during our research. From there, you could purchase separate vitamin and supplement ‘e-juice’ blends, which would ultimately deliver the lowest cost per use. Pro tip: NutroVape’s vaporizers can be recycled, although you’ll have to find a location near you that recycles lithium batteries and deliver them yourself and potentially pay a fee, depending on your municipality. When it comes to natural vaporizers like NutroVape, is it necessarily a question of money, though? Breaking it Down: Is a NutroVape Natural Vaporizer the Right Option for You? Are the ingredients they contain effective? Even if they are, is inhaling these ingredients via a glycerin-based vaporizer the best method of ingestion? 1. 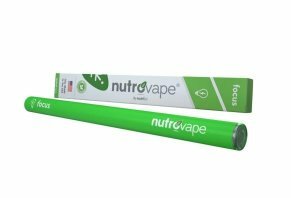 Are NutroVape's Ingredients Effective? The reality is that it would take another entire article to even briefly discuss the overall clinical evidence for each of the ingredients found in NutroVape’s formulas. However, even for those reported by sites like WebMD and the Natural Medicines Database (to name just two authoritative resources) to have sufficient evidence supporting the manufacturer’s claims, there aren’t any dosages listed. As such, we can’t know if NutroVape’s customers are getting the same amounts found in supporting clinical studies. In fact, since customers are instructed to take a varying number of inhalations, it's reasonable to assume that dosing can vary widely. 2. In General, Do Vitamin Vaporizers Work? For example, the Genetic Science Learning Center at the University of Utah confirms that the fastest way to get most chemicals to the brain is, indeed, via inhalation. But not all chemicals work on the brain, so it’s not always an ideal administration method. In the meantime, if you feel you’re deficient in vitamins or are otherwise experiencing frequent fatigue, memory and concentration concerns, sexual dysfunction, problems sleeping, or any other conditions often addressed by the natural vaporizers, be sure to have an in-depth conversation with your doctor. Write a Review for NutroVape Natural Vaporizers!